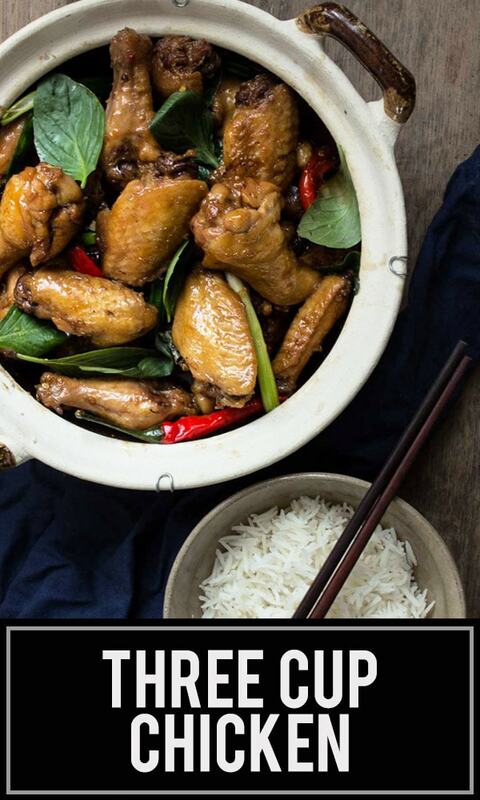 Three cup chicken is a Chinese dish that is traditionally made with 1 cup of soy sauce, 1 cup of cooking wine and 1 cup of sesame oil, hence the name three cup chicken. 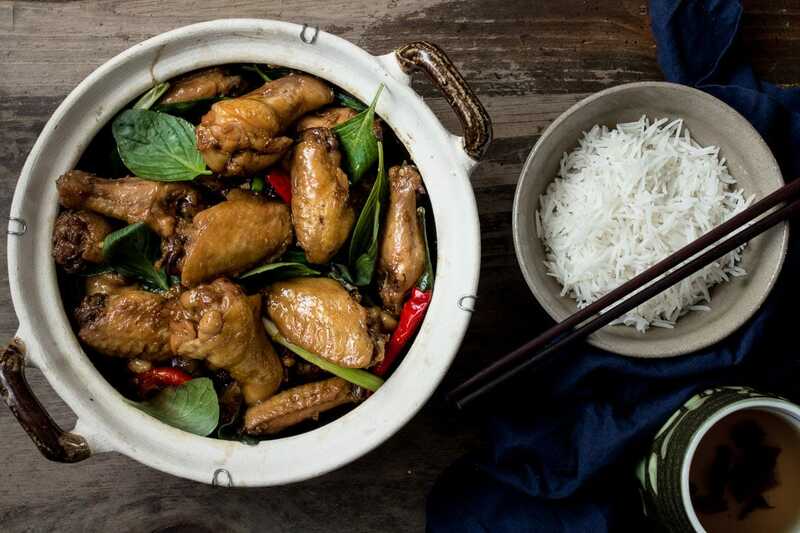 Three cup chicken is also traditionally cooked with an abundant of aromatics such as garlic, ginger, chilies and basil which gives this dish some crazy intense flavors! For this recipe, I tweak the amounts of soy sauce, sesame oil and Chinese rice wine, so that the sauce is not super salty and greasy. I also like to use caramelized shallots and add fresh green onions (which is not traditional, but my own twist) to give this dish even more flavor! The magic is really in the addictive sauce that goes absolutely amazing with rice. The best part of this recipe is, it uses only one pot (or pan) and it’s super easy to make, especially if you want something on the table quickly. From start to finish, the recipe takes about 30 minutes to make since we are using smaller (bite-sized) pieces of chicken so it cooks quickly. 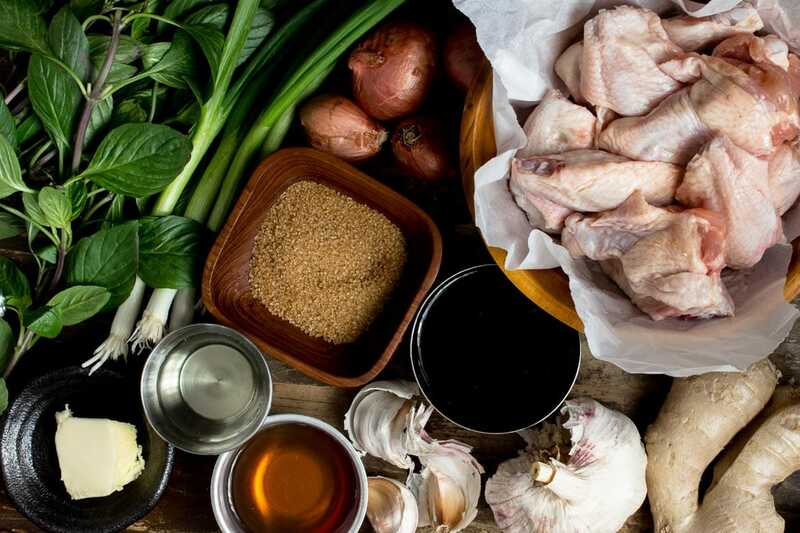 For this three cup chicken recipe, you can find most ingredients at your local grocery store, with the exception of the Chinese rice cooking wine. Chinese rice cooking wine can be found at an Asian grocery store or online. For this recipe, you can also use Shaoxing cooking wine to substitute the rice cooking wine. Traditionally, three cup chicken is made with chicken legs which have been chopped into smaller pieces using a meat cleaver (bone in). Unfortunately, it meant that if the cleaver wasn’t sharp enough, the cuts between the bones would have bone shards and fragments which are terrible to eat through if they were not carefully picked out before cooking it. 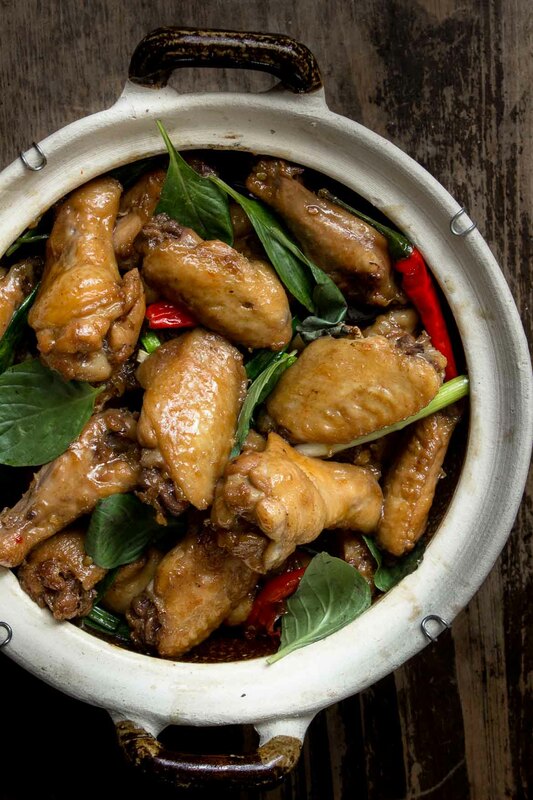 Chicken drums – Chicken drums also have the bone, and is a lot more meatier but it takes slightly longer to cook because of its size, with it’s bone in and all. 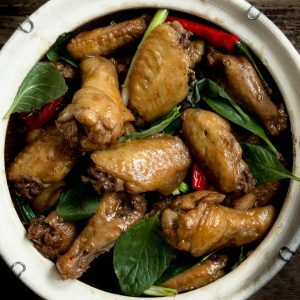 Boneless dark meat (any cut, cut into small chunks) – This is also an amazing alternative if you are okay with having no bone in your recipe. Every bite is bite-sized boneless meat so it’s a lot easier to eat, and it also cooks a bit faster too. Boneless white meat (cut into small chunks) – If you’re looking for a healthier cut of meat, white meat also works but you have to be careful not to over cook it so it stays tender and moist. I like to marinate the chicken chunks in a 1:1 ratio of soy sauce and water (like a mini brine) 1 hour ahead before using it. This mini brine draws the water into the meat (you’ll notice the mini brine actually disappears and gets absorbed) which makes for a more moist chicken. 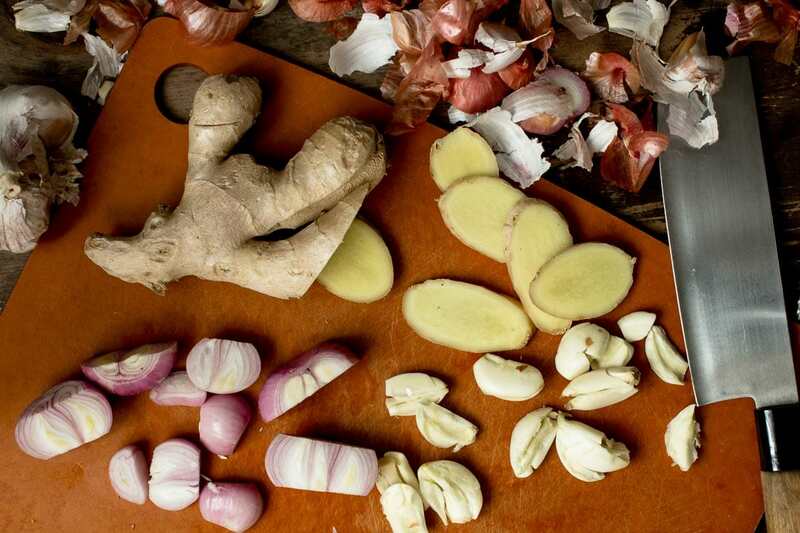 For this recipe, you want to keep the aromatics (ginger, garlic, shallots, chilies) big and chunky so they don’t burn as easily since you will be toasting them in sesame oil for quite a bit of time (and so you can pick out the ginger slices easily before eating it). Don’t worry, they won’t stay big and chunky. The caramelized garlic and the shallots will eventually soften and slightly melt into the sauce during the braising step. Why Is There Water In This Recipe? Whenever I make this dish, I find it quite salty. Especially, when the sauce starts to reduce at the end. I found that the best way to work around that is by adding water to the sauce. It will take a bit more time to reduce the sauce to thicken it but the sauce will be a lot less saltier, without sacrificing any flavor. 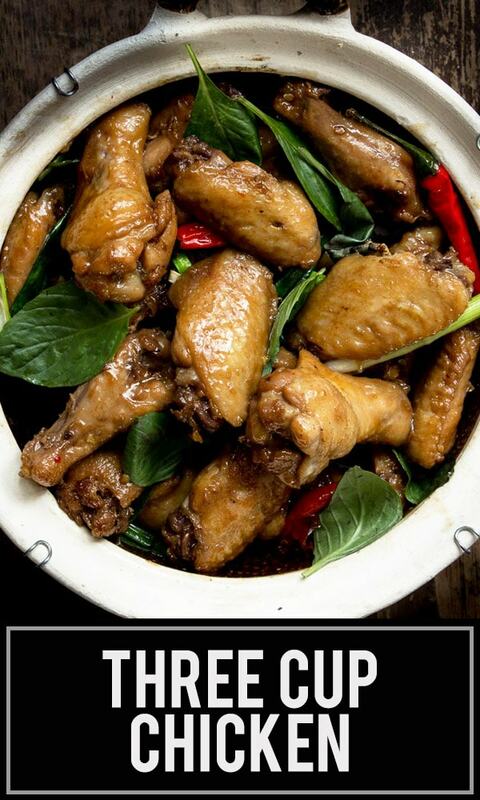 Delicate spices and aromatics like fresh basil, lose it’s flavor when it’s cooked. To keep this dish super flavorful, I like to add the green onions at the very end to wilt it slightly and then turn off the heat before putting in the basil leaves. The residual heat from the chicken will wilt the basil slightly but will not cook out the oils which give it its flavor! 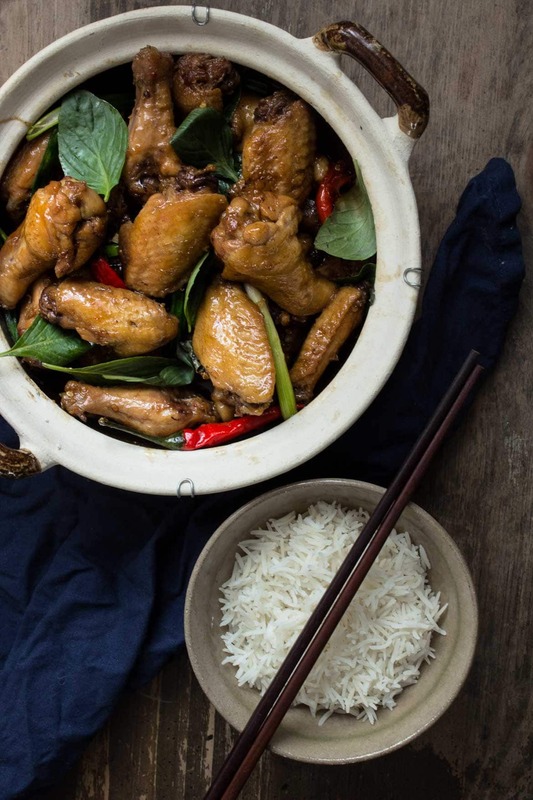 A super easy, one-pot recipe for an incredibly flavorful, three cup chicken that is loaded with garlic and ginger and braised in a sesame soy sauce which caramelizes into an addictive sauce that goes amazing with rice! 15 cloves garlic – smashed and intact, do not chop them. Once the sugar has dissolved, add the soy sauce and Chinese rice wine. Mix it and set aside for later. Set the stove to medium heat and add the sesame oil into a large pot. Try to use a pot with tall wall to prevent the oil splatter from getting everywhere. Once the ginger has toasted for a bit, add the shallots, chilies and garlic and toast it for 2 minutes until it is golden brown. Once the chicken has slightly browned, pour in the sauce and cover the pot with a lid. Adjust the heat to medium low heat and let it braise for 10 minutes. Once 10 minutes is up, remove the lid and raise the heat back to medium heat. Let everything simmer for 8-10 more minutes (lid off). The sauce will start to caramelize and thicken. Once 8-10 minutes is up and the sauce should have thickened, add in the green onions and mix well for 1 minute. Turn off the heat and add in the basil and mix well. Delicate aromatics such as fresh basil loses a bit of flavor when it’s cooked for too long. Using the residual heat from the dish to wilt it, maintains the flavors. Do not substitute Chinese Rice Wine with Rice Vinegar – it is a completely different flavor. You can substitute it for Dry Sherry or Shaoxing Cooking Wine for this recipe. If you substitute it with Dry Sherry, the sauce will be slightly more sweeter since Chinese Rice Cooking Wine and Shaoxing Cooking wine have a bit of salt in it. This recipe also works well with white meat. 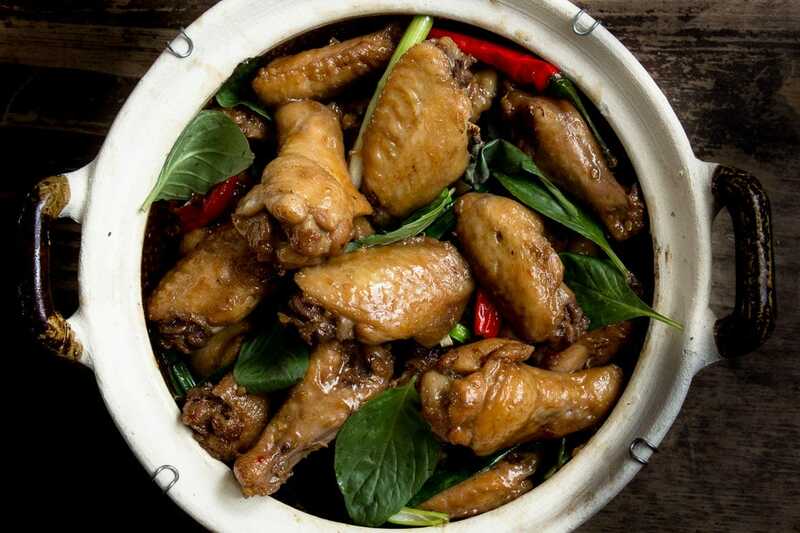 If you use white meat, cut it into bite sized chunks and marinate it in a mini brine of 2 tablespoons of soy sauce and 2 tablespoons of water for 1 hour before using the chicken. This will keep the chicken moist and tender, and won’t overcook as easily. If you use boneless chicken, the sauce will need to use a corn starch slurry (1 tablespoon of corn starch mixed with 1 1/2 tablespoon of cold water) to thicken the sauce at the end. The cartilage from the bones helps thicken the sauce to a thicker consistency. I finally made the double batch of these wings, following Joyce’s tips for making in advance, and they turned out great! Five red Thai bird’s eye chilies plus 4 green ones made a really nice medium spice level. Everything took longer for me though (getting the aromatics browned, and the wings didn’t brown well given that there were so many) but it was worth it in the end! Great flavour. I ended up leaving the wings in the sauce to store and I felt that helped the flavour infuse even better. Will make them again for sure! Thanks Joyce! Thanks for letting me know about doubling the ingredients, Joyce, as well as that you’d updated the recipe. Appreciate it. 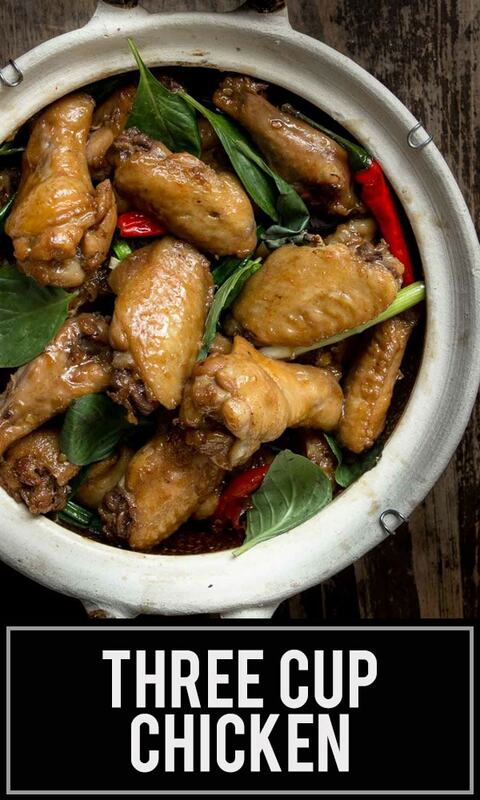 I will make this tomorrow to eat later in the week… any tips on making/storing/reheating – am wondering if I should cook the chicken for less time? Or store the chicken and liquid separately, in case the sauce gets very gelatinous- wouldn’t want the wings to break up if I’m just scooping our a few wings at a time? Ah yes, the cold gelatinous sauce, the best part! haha 🙂 Yea if you have a lot of extra sauce, and you don’t want to rip up the chicken and make it easier to separate for the next day then store the sauce in a separate container from the wings. They can be stored in the fridge with no issues otherwise. To reheat them, I like to use the microwave. If I pack it for lunch I put rice on the bottom of the container, put some wings on top of the rice, add some gelatinous sauce on top and once it’s reheated in the microwave the rice is saucy! If I’m just eating them at home again, I just put the wings and sauce in the same bowl and reheat it in the microwave. Excellent. 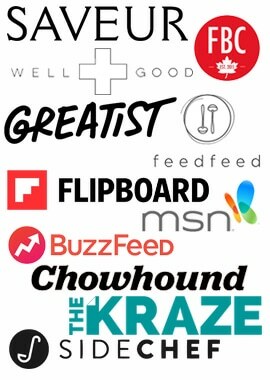 All great tips. Thank you Joyce!! Could I use Thai basil instead of regular basil? Thanks! I usually use Thai basil for this dish 🙂 Sometimes when I don’t have Thai basil around, I will substitute it with regular basil, but my preference is usually Thai basil. Thanks Joyce! That’s awesome because I bought a ton of extra Thai basil by accident 🙂 Look forward to trying this recipe! Happy to help Jenn! 🙂 Hope you enjoy it! Is rice wine different that Mirin? Yup, they are a bit different. Chinese rice wine has salt in it, so it is slightly salty. Mirin has sugar in it, so I find it quite sweet. It wouldn’t work very well in this recipe as a substitution since you need to reduce the sauce at the end and 1/4 cup of mirin reduced would make the sauce very sweet. Could you direct me to a ‘traditional ‘ version of this so that I may learn the effects of your variations? 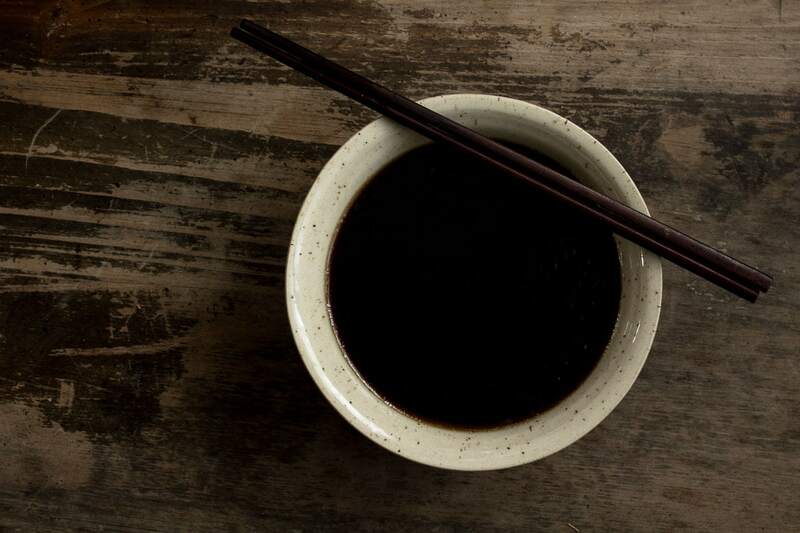 Light, medium, or dark soy sauce? This is the traditional recipe, I just adjusted the soy sauce, rice wine and sesame oil amounts so that it’s not super salty and greasy. The only thing I tweaked about is by adding shallots and green onions for extra flavor. You can omit those if you like. I use regular soy sauce for this recipe, I switch between Pearl River Light Soy and Lee Kum Kee’s Soy Sauce (the red labeled one, which I think is medium soy sauce). Dark soy sauce is too syrupy and thick and will not work very well with the recipe and will make the final dish almost black in color.